Wow– I had no idea that recapping last Saturday night would turn into a three-parter! I guess that is a sign that it was indeed a fantastic evening. Check out part 1 and part 2! After dinner at Kartabar, one of our friends suggested we check out a new-ish tequila bar and cantina in Providence over by the Providence waterfront. Promises of chatting outside with friends at tables by the water on that warm evening were enough for me to want to go, despite the fact I don’t drink! I was quite curious to see what this new hot spot was all about. 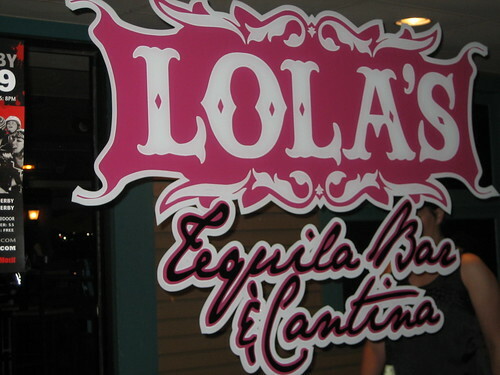 Lola’s Tequila Bar and Cantina is located in a building along part of the Providence waterfront that is home to a couple of other adjoining bars with outdoor seating right on the water. Not only was Lola’s itself pretty packed, but the whole strip by the water was jamming with people enjoying drinks by the boats docked along the decks. We were fortunate to get some of those coveted outdoor picnic table-style bench seats, complete with a towering umbrella overhead shielding us from the (not at all threatening) elements. While we had no intentions of ordering food, we were brought menus anyway. I couldn’t help but flip through, just to see if this was a place I would like to actually eat at in the future. The menu featured pretty typical Mexican-food favorites like enchiladas, nachos, and burritos, all of which looked like they could be easily veganized. I definitely would love to come back to Lola’s to try the food, but since we were stuffed from Kartabar, this just wasn’t the night for it! The menu that did peak the interest of my dining companions was the dedicated tequila menu. To say the tequila options and drink variations were seemingly endless is an understatement! 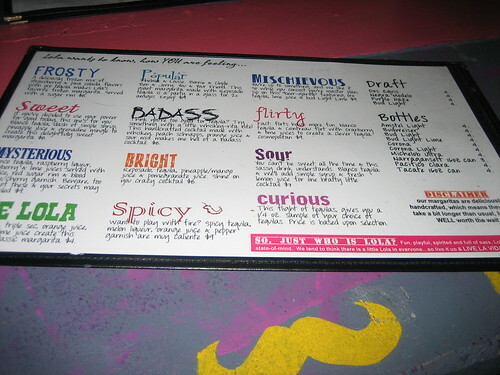 Despite my teetotaler status, the tequila drink names certainly provided me with some amusement! If I did drink tequila, I think the drink for me would have to have been the “Badass” for obvious reasons. . . Still, chips and salsa were brought to the table, and my friends and I couldn’t help but pick at them. 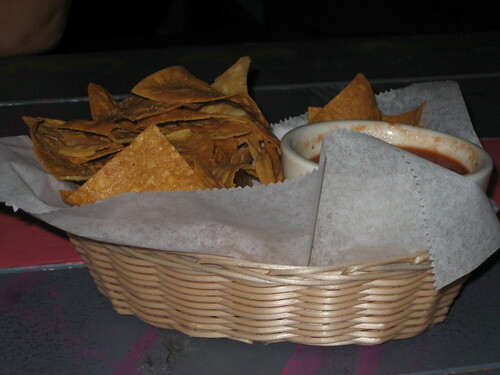 I mean, they presented us with not one, but two overflowing baskets of chips and salsa– we had to try them! I am happy to report the chips were nice and crispy and the salsa spicy but not over the top burning. If their chips and salsa are an indication of their other menu offerings, than I was already sold! I wish this review could actually contain an analysis of the various tequilas offered, but again, my non-drinking status puts my at a disadvantage in regards to that task! What I can comment upon though is the atmosphere of the outdoor seating area. 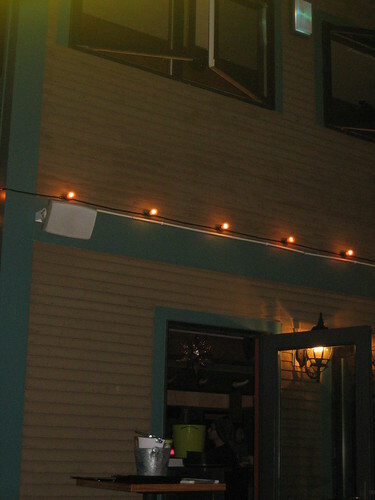 As you can see, from the pic below, the back of the restaurant opens out to a back deck where we were seated. The atmosphere was lively and festive, with an outdoor bar and plenty of picnic tables for seating. Next door at a different bar, a band and dj were playing, so we had quite the musical accompaniments. Poor Lola’s own outdoor music system was kind of drowned out, but honestly, I beleive that having a band next door is a rare occasion– I think they were performing for a private event. It did a great job replicating a beach-side bar with the way it overlooked the water, even though we certainly were not even close to a beach! As far as the tequilas, all I can say is the four people I was with ordered various tequilas and were quite impressed with their own choices and the general breadth of the selections offered. More so than the expansive tequila menu, my friends and husband were impressed by our waitress– I do not honestly think I have ever come across a waitress who knew so much about the menu she was working with. This girl knew tequila, inside and out– no question! My party asked a ton of questions about the tequilas on the menu, and she swiftly provided all of the answers in a friendly, endearing way. I almost wished she could sit at our table and hang out with us– I know the boys would have talked tequila with her all night long! She definitely ruled! My final analysis of Lola’s is as follows: first, it was a really fun, lively place to hang out, especially because of its waterfront views and location next to other busy bars; second, I do want to come back for the food; third, the tequila menu and offerings were determined by my partners in crime to be very impressive; fourth, the waitstaff was helpful and extremely knowledgeable about said tequilas, and finally, the place was really cool overall! 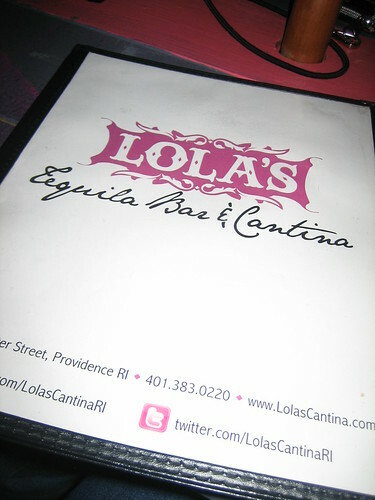 Lola’s Tequila Bar and Cantina is certainly a spot I would recommend to anyone, but definitely to those who want to experience how awesome Providence can be on its often overlooked waterfront area. Since I couldn’t indulge in the post-dinner drinks, I made sure to reward myself with a post-dinner dessert at home! 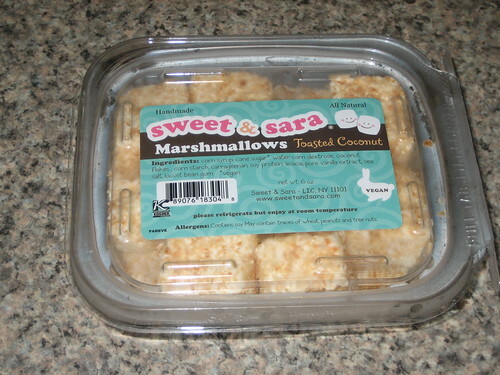 I was extremely eager to try these vegan marshmallows from Sweet & Sara I have been seeing in Whole Foods forever but never actually purchased until recently. See, I love marshmallow flavor, but have never wanted to eat an actual marshmallow due to the fact they contain gelatin. Vegan marshmallows solve that issue for me, so I finally broke down and bought a pack of the toasted coconut variety. I grabbed a few marshmallows and put them in the bowl along with a frozen vegan, gluten-free almond apple muffin from Wildflour Bakery here in Providence that I saved for a special occasion. I nuked both the marshmallows and muffin together in the microwave for about a minute, so the muffin got all nice and warm and the marshmallows all gooey. 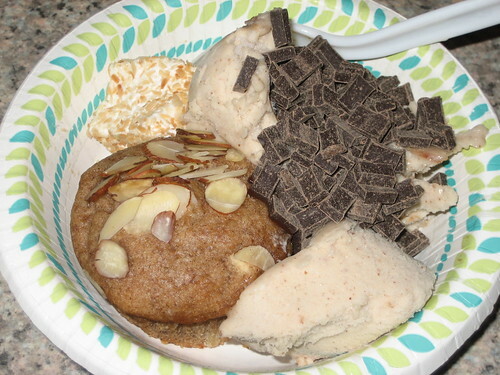 I then topped the concoction with some vegan praline ice cream and dark choco chips. Note to self– add heated Sweet & Sara marshmallows to each and every dessert bowl I create from now on! They were awesome! They melted well, but even better, the taste was amazing. They were so full of bold vanilla and coconut flavors! I am offically a huge fan. So that’s it– I can finally say after that dessert, my epic Saturday night finally came to a close and dragged myself to bed. I hope each and every Saturday from now on is as fun and full as that one! 2 Responses to "Beyond Thayer Street: My Final Adventures On Saturday Night"
I love the menu fonts! and is that a mustache on the table? haha. and that dessert bowl looks incredible!!! You are so observant– good eye!!!! Honestly, I had to look back at the pic and then I spotted the moustaches! Talk about me being oblivious!